Conor McGregor steps up in the boxing ring for the first time in his career and will face the unbeaten Floyd Mayweather, the best fighter in modern boxing. Fancy Floyd Mayweather to beat Conor McGregor? Get a sensational 40/1 Floyd Mayweather to win! Only the first £1 of your bet will be used for the enhanced odds. 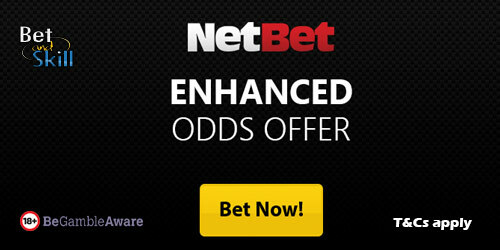 Open a new Netbet account right now and take advantage of this promotion! Open a new account, you will be excluded if you are found to have an existing account. To claim the full winnings, enter the code MAYWEATHER in the ‘Promotional Code’ area on the registration page. You may be credited an initial £0.01 as an initial credit upon activating the promo code, this confirms that you are eligible to receive the full winnings. Place your FIRST BET up to a maximum of £1 (or to the same real value in an alternative currency), as a single bet on Floyd Mayweather to win. Accumulator / Combo bets are excluded from this promotion. Placing a bet larger than the maximum stake is accepted but the player will only receive winnings on the first £1 of their bet. If the bet wins, you will be part paid in cash based on the normal price on site and will have the extra amount, bringing the bet up to the cumulative pay-out, credited as free bets, and added to your account within 48 hours after the official result. If you make a withdrawal of cash funds while the rollover of a free bet has not yet been fulfilled, it will result in the removal of any free bet balance. Valid for new customers only, you will be excluded if you are found to have an existing account. This offer is for pre-match bets only, In-Play bets are excluded. The maximum stake eligible for this offer is £1 or the alternative currency equivalent at the current market exchange rate. Free Bets must be used in their entirety. Can only be used on single bets. The Free Bet will be available to use for 7 days upon receiving it. Offer only eligible to customers who register through this landing page and also use the designated promotional Code. This promotion is for a limited time frame only and NetBet reserve the right to end this promotion at any time. All decisions made in regard to this promotion are at the discretion of NetBet. Use of an existing free bet or another welcome bonus to enter this promotion will disqualify you from the free bet winnings. Offer applies to all players eligible to use promotions on our .com and .co.uk brand. Customers deemed to be abusing the enhanced promotion will be excluded. Use of this offer excludes players from qualifying for any other NetBet Sport New Customer offer. Making a combination bet will exclude you from the promotion. You will not qualify for the enhancement if Cash Out is used on an enhanced selection during or before the promoted event, or if a bet is cancelled. Duplicate accounts are not eligible for this promotion. Due to the abuse of promotions, customers using Moneybookers or Neteller to deposit will not qualify for this offer. This offer applies to UK & IE Customers only. "Mayweather best odds - 40/1 to beat McGregor at Netbet"